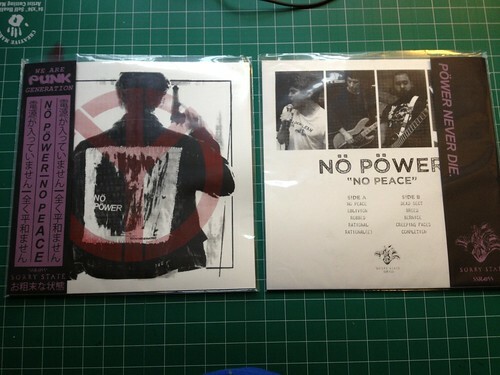 Nö Pöwer: No Peace 12"
After a quickly-released blur of tapes and 7"s, North Carolina's Ní_ Pí_wer unleash their debut 12" on the world. While I like their earlier stuff (which was pretty straightforward raw d-beat in the Disclose tradition), Ní_ Pí_wer really finds their voice on this LP, fusing their Discharge-inspired approach with the heavy and dissonant sounds of 90s noise rock. It's an original sound, comparable to a more rock-oriented take on the experimental d-beat of recent Japanese bands like D-Clone and Zyanose, delivered with heavy production for maximum impact. This LP features gorgeous hand-made packaging, too, including hand-screened jackets and obi strips as well as hand-stamped labels and dust jackets. The 1st press is limited to 300 numbered copies.